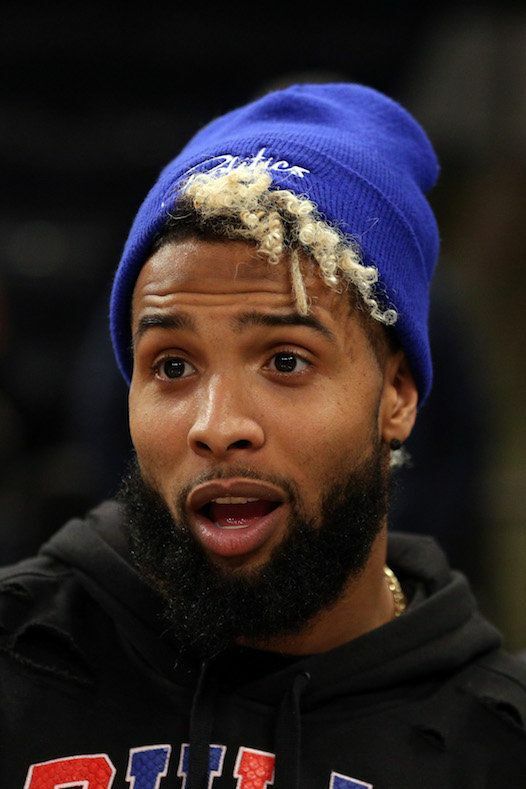 As if being one of the most popular athletes in America isn’t enough, Odell Beckham Jr is also one of the most emulated men in the world for his interesting and cutting-edge style and fashion. 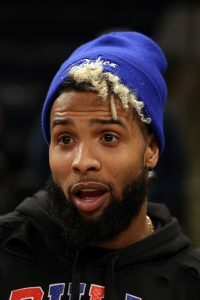 Still in his early 20s, Odell already has a fashion line to his name, and his fun haircuts and unique sense of style have identified him as a trendsetter who’s always ahead of the curve. 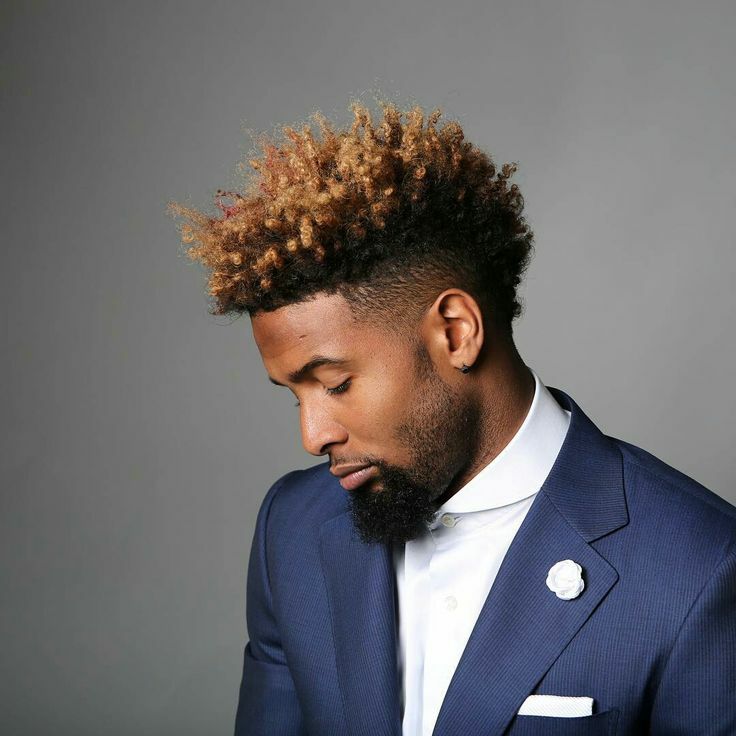 Playing with both color and texture, Odell Beckham Jr’s is known for his current blonde style, but has played with other shades and styles in different lengths and textures. 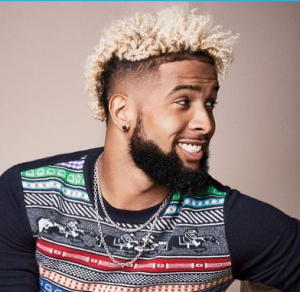 If you’ve been thinking of upping your game and getting a haircut inspired by Odell Beckham Jr, we’ve gathered 15 of his best looks, along with some insider info about getting that signature blonde style. Odell Beckham Jr is known for wearing his natural curls in some very light blonde styles, which are a big part of his hair’s popularity. 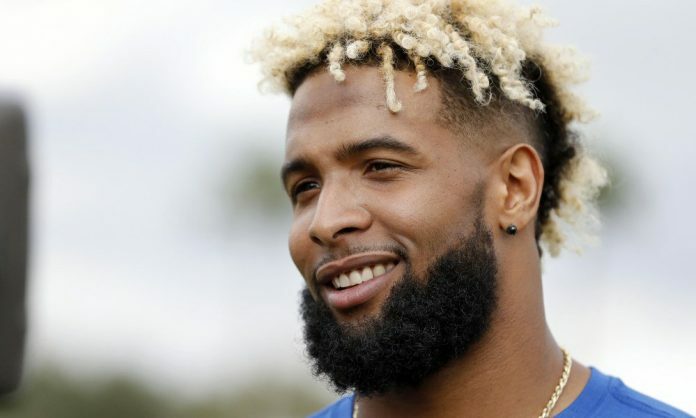 But if you’ve got natural curls that have never been dyed, it’s a good idea to know what to expect before trying to go as blonde as Beckham Jr. In order to go from natural black hair to a shade this blonde, you’ll need to use bleach to chemically lighten your hair. Because it’s only safe to leave bleach on for an hour max, anyone with jet black hair will almost certainly need to do more than one bleaching session. To prevent stress and breakage, these bleaching treatments should be at least a few weeks apart. Be prepared to live with a red or orangey shade during this time. If you’re after a really white blonde style, your hair will likely need to be toned after bleaching to remove warm and brassy tones. We recommend having a professional or a friend who’s an experienced at-home hair dyer bleach your hair. Lightening your hair improperly can lead to damage, and anyone who’s attached to their strands should leave the lightening to someone else. A younger look from his LSU days, Odell Beckham Jr is hardly recognizable without today’s trademark blonde curls. This classic fade cut is a simple, clean-cut style that looks good on just about any guy. 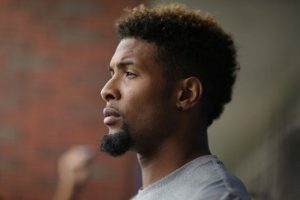 OBJ certainly doesn’t need any help with his chiseled features, but guys who feel self conscious about their fuller cheeks will appreciate how a haircut like this fades in at the sides for an instant slimming effect. 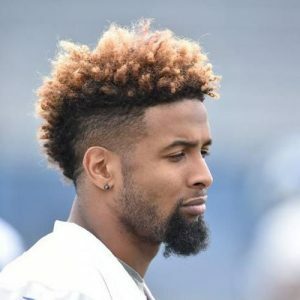 This curly style from Odell Beckham Jr shows off a nice mid-point between the ultra short fade cut and the longer looks he’s become so popular for. His hair here is long enough to show off its natural texture, but not so long that it needs a ton of styling effort put in. 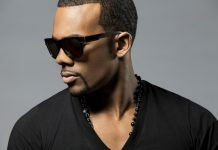 In order to make hair look neat at this length, curls are slightly tapered down towards the back and sides of the head. 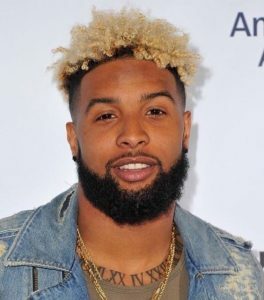 This tapered curly cut also comes with some styling versatility, and you can use a curl sponge or twist out technique to create more defined texture. 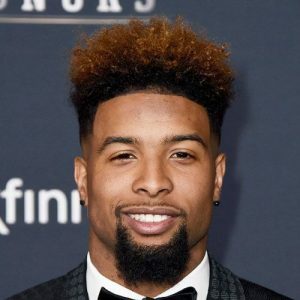 Some guys might feel like blonde isn’t for them, but adding a lighter color to your hair does more than just draw attention to you, it shows off your hair’s texture in a whole new light. The blonde against black look is definitely attention grabbing, but it also helps to show the spiral texture in these longer pieces of hair. Also known as the gentleman’s mohawk, the South of France haircut puts a dapper spin on the typically edgy silhouette. 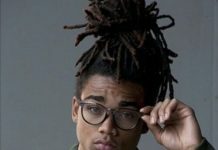 The strip of longer hair that runs down the middle of the head is wider in this style compared to a typical mohawk, and often the difference between long top and short sides is much less dramatic. This is a great haircut for sculpting your face: a classic shape up at the hairline helps to frame the eyes, while shorter hair at the sides of the head help to make the face look slimmer. This temple faded style features faded areas at the temples and in front of the ears, creating a high volume look with a defined shape. Also known as a blowout, this haircut creates an almost windswept look, and can help to add some height to your look or balance out a strong jaw by adding some width to the upper half of the face. Combined with a medium blonde highlight applied to the curls, this temple fade haircut strikes the right balance between fun and dapper. 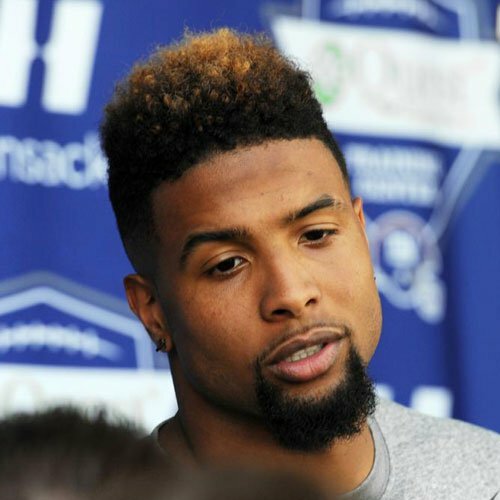 Odell Beckham Jr’s blonde curls look almost gravity defying in this long on top hairstyle. 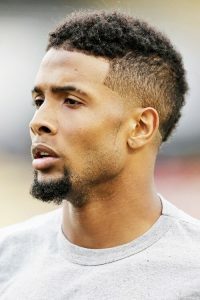 Like most of his longer looks, this haircut features closely tapered sides that help to create a nice contrast between the longer texture on top. You can use a braid out or twist out technique to get softer texture like this on your longer curls, which makes for an easy way to slightly switch up your look. With longer hair on top that’s been tightly shaped at the sides, this high top haircut is a geometric style that’s got a great blend of retro style and modern edge. This style does all the right things for guys who are looking to slim their face. 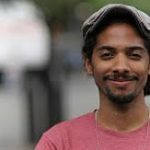 While the height of the curls and the sculpted goatee add length both above and below the face, tightly faded sides help reduce width and slim. As his most current and arguably most popular hairstyle, this long blonde style is also OBJ’s longest look. We love how this longer style adds some softness to his natural texture, giving his curls enough room to be softly separated and swept over to the side. 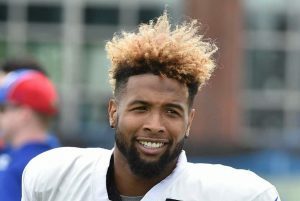 Balancing out the longer hair on top, this is also one of the longest facial hair looks we’ve seen on the Giants wide receiver. 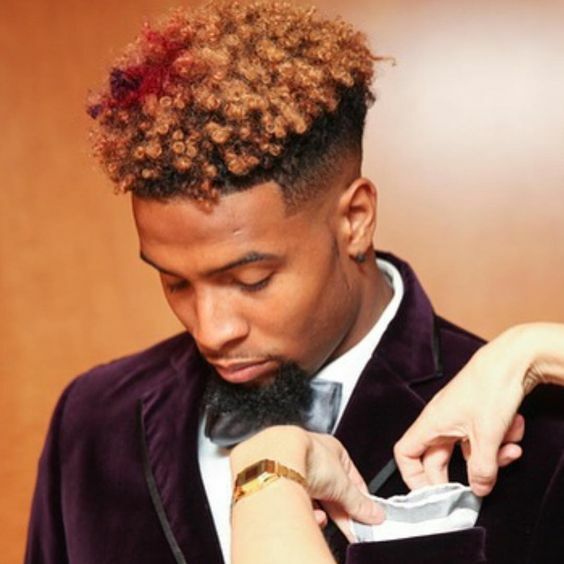 Even for a risk-taker and trendsetter like Odell Beckham Jr, this red and blonde look is a pretty daring choice. When asked about the style, OBJ assured us it was an intentional choice, and may have had some sort of symbolic meaning. 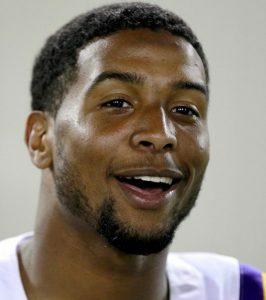 Guys who aren’t wold famous athletes may prefer sticking to one accent color at a time. Try bleaching your hair to a blonde color first, then going for a new red style if you get bored of the blonde. 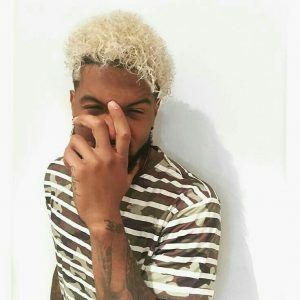 For any guys who are hoping to get an ultra blonde style straight from natural black hair, this look gives you a good idea of the hair color you’ll probably have to spend some time at first. Hair that’s naturally black usually requires more than one bleaching session, leaving you with an orangey or copper shade for a few weeks until it’s safe to bleach again. 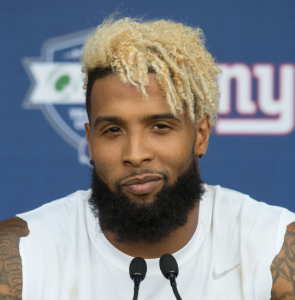 Odell proves here how going copper can definitely be a good thing, pairing his long curls with tightly faded sides that melt right into the skin. If ultra light blonde it a little bit too flashy but you’re still looking to step it up from your natural hair color, try going for a medium warm blonde. This hair color is perfect for highlighting natural curls worn in a longer length, and creates a neat contrast against darker roots that makes the style easy to grow out. Wearing it in a mohawk fade gives this look a bit more edge, bringing you a haircut that looks bold but not too over-the-top. Another early look from Odell Beckham Jr’s college years, this short style is a classic look that’s great for men of any age. Unlike super short fades that tend to hide hair’s natural texture, this haircut is just long enough to create some softness around the face. Tapered shape brings things in around the ears, which can help slim your face without requiring a dramatic difference between long and short hair. 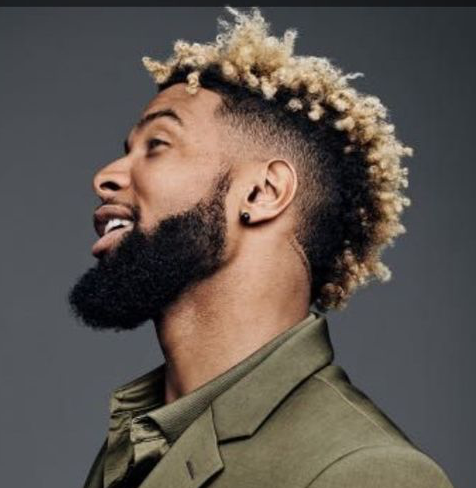 One of Odell’s best known looks, this blonde mohawk has just the right amount of edge, and shows off the contrasting combination of blonde curls against closely faded sides. 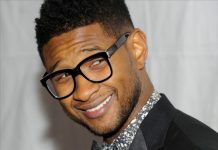 The hairline around his forehead is also done in a close cut style, which helps to frame the features and keeps longer curls from easily falling into the eyes. 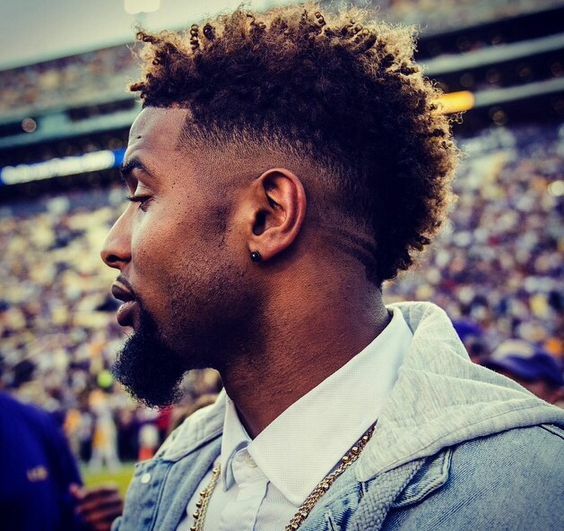 The burst fade mohawk has become a modern classic haircut for black men. It shows that you’re interested in looking stylish and up-to-date, but doesn’t look so edgy that you can’t pull of the haircut in a professional setting. Odell’s long blonde looks usually feature his hair’s natural texture, with well defined spiral curls that stand out against darker roots and shaved sides. This more processed style leaves his natural curls looking more teased, creating a cool look that’s got more retro inspiration than most of the other hairstyles we’ve seen him in.